Tough economy getting you down? 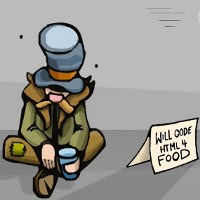 Bummin’ A Ride, a new hobo-centric role-playing-game by developer FineFin (Air Drop) and BumArcade, lets you hitchhike and scavenge your way across the country, without ever leaving the comfort of your own desk chair. The setup is basic, but effective. You play as a New York vagrant who receives a surprise letter. Sadly, it turns out that Uncle Bob passed away. Not so sadly, he’s left you one million dollars in cash, with a catch: If you don’t make it to Los Angeles within 25 days, all of the money goes to an orphanage. The game will end if your bum runs out of health, or doesn’t reach L.A. within the allotted 25 days. The key to succeeding is effectively managing your daily activities so that you always have enough health, money, and action points. Bummin’ a Ride is surprisingly fun game. While none of the included mini-games are meaty enough to stand alone, they add just enough extra flavors to the game’s strategy/role-playing elements to keep things interesting.